Why do the Lib Dems stay in the coalition? Why the LDs are not desperate (regardless of electoral prospects) to get out of the Coalition mystifies me … that is, it mystifies me for all those who are not Orange bookers and/or not the chosen few who enjoy a ministerial car. Apart from any other consideration, why do they want to stay and be tarred by association with George Osborne’s misguided destructive policies? Osborne’s economic strategy has even been criticized by the IMF! Clegg trades on the fact that he is the first peacetime Liberal in a century to preside over government. That is no mean feat and, by the nature of coalition, requires compromise. The public appears to appreciate, better than the Westminster village, that give and take is a sign of a mature political system. In what sense is it ‘no mean feat’ to happen to be the leader of a political party when another party fails to secure a majority, and to be prepared to accept the offer to form a coalition? And given the LDs crashed-standing in the opinion polls, where does he observe the public appreciating that LD ‘give and take is a sign of a mature political system’. Maturity? Exactly what is immature about vehement opposition when faced with the disastrous policies that are being imposed on the UK populace? Why is it ‘grown-up’ politics to stay ‘stumm’ as Kampfner suggests? In fact, what ‘give and take’? On what, in particular, have the Tories compromised? Yes, they organized (and sabotaged) a referendum on AV, and went through the motions of supporting (and sabotaged) House of Lords Reform. 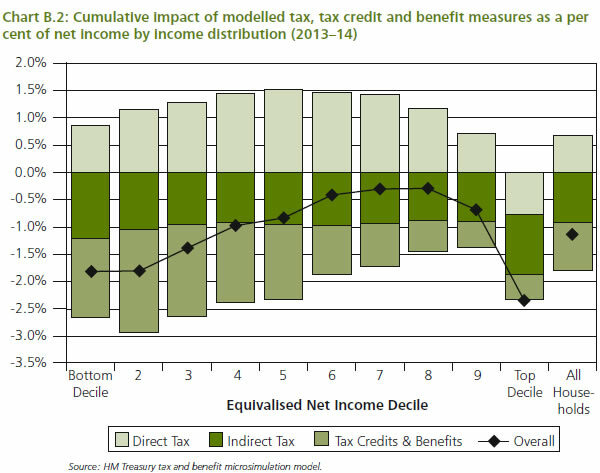 As Chart B2 of the Budget 2012 Red book (pdf) shows, the cumulative effect of this budget and previous announcements is regressive for the bottom eight deciles. The ninth decile pay less proportionally than the poorest half of people. But the budget is progressive when looking at the richest 10 per cent versus the rest. According to John Kampfner, Nick Clegg has a more coherent vision for social justice and social mobility, with which he advises Nick Clegg to stick…. However, I simply cannot see that Nick Clegg has ever advanced anything like a coherent vision. A belief in social justice for the disabled, the unemployed, the low waged, is totally incompatible with voting through of the Welfare Reform bill and supporting the Legal Aid bill, let alone reducing the highest tax rate to 45% for the very wealthiest people. And as for social mobility… Has John Kampfner seen the fallen rate of applications to University after the introduction of £27K student tuition fees, and the impact of removal of EMA? He must also know that there are over 1m unemployed 16 to 24y olds. Does he realise that new official figures covering the academic year to April 2012 reveal the number of 16 to 18-year-olds starting on-the-job training schemes increased by just 1.4pc, to 104,500 (6)? Whilst in the North East, North West and South West, apprenticeship starts have dropped. Furthermore, the quality of those apprenticeships is highly questionable. A BBC investigation has found that Morrisons supermarket employed more than 1 in 10 of all apprentices across England last year (7). In addition, where is the social justice in the government rolling out workfare on a massive scale? Tens of thousands of forced unpaid work placements have already taken place. The government intends 250,000 workfare placements on the Work Experience scheme alone. If each placement is 8 weeks of 30 hours work, this is 60 million hours of forced unpaid work. 850,000 people are expected to be referred to the Work Programme by the end of this year. However, due to the “black box” approach the government uses with the private providers, it has so far refused to publish how many of those are being forced to work without pay. This all sounds less like social justice or mobility, and more like increased profitability for businesses like Morrisons. We were told that the LDs went into Coalition with the Tories because the UK was on the verge of becoming like Greece. That the Labour government had irresponsibly overspent on public services, and it was effectively a national emergency. It was said that Vince Cable u-turned his pre-election economic assessment on seeing the figures, and then agreed with Osborne’s plan for expansionary fiscal contraction (more like inherently contradictory … expansionary and contraction). Not only was the national debt inflated by the ‘socialisation’ of banking losses rather than by public spending (9), but there was absolutely no possibility of the UK being like Greece, a country without its own currency and no central bank (Will Hutton called the suggestion risible). There was no national emergency, on the scale suggested, as the graph below shows (10). 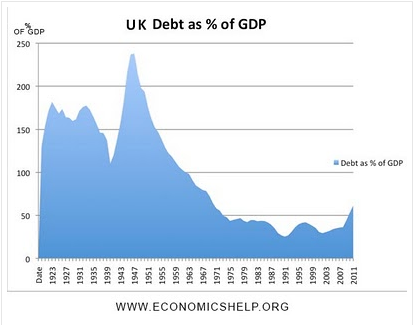 The UK has had much worse national debt and was in a much better position than many other countries. ‘The Lib Dems have taken the blows, over tuition fees and more. They have lost the opportunity to modernise our moribund constitution. They have kept stumm for the sake of stability, and been accused by the left of treachery and by the right of petulance. Clegg has two and a half years to put a strongly liberal stamp on government as it seeks a path out of the economic mire. With David Cameron and George Osborne lashed to a failed Plan A and no sign of shifting, lashed to a failed Plan A, the one credible reason for the Lib Dems to break the coalition is to save the country from yet worse damage. Given what Clegg has led his party to vote for – benefit cuts for the poor, tax cuts for the rich – it is almost too late. But for each recession month that they stay on, tolerating all this, the Lib Dems lose credible reasons for ever making the break. Personally, I have to admit to a fair degree of sympathy for the ordinary grassroots LD whose cognitive dissonance levels must currently be topping even those of grassroots Blair/New Labour believers. They are having to justify the dismantling of the NHS, the dismantling of local democracy in education, replacement of Trident, dissing of the green agenda, nuclear power, a new runway at Heathrow, taking benefits away from disabled children and so on… for what? To prove that coalition works? I have always respected John Kampfner as a journalist, then Editor, at the New Statesman. For the man, who so comprehensively exposed Blair’s failings, to be turning himself inside out trying to justify the LD leadership’s current position seems so very sad. The upper echelons of the LD leadership do not deserve it.